This is a brilliant portable dvd player for any Cars Fan!! 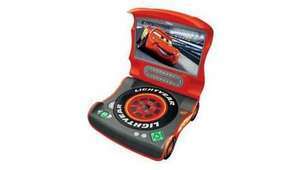 This colourful 7 inch portable DVD player is the perfect gift for any Cars fan! Both stylish and easy to use, your child will be able to sit back and relax for hours watching their favourite films. Supports CD, CD-R, CD-RW, DVD-R, DVD-RW and picture CD. 2 channel audio output. 7 inch visible screen size. Great price considering that someone local has been selling one for £30 2nd hand! Argos were selling these in their stores for £29.99 each about three months ago, I bought one from them at that price for my son for his 5th birthday.